SECO/WARWICK Gas Nitridig Furnace ZeroFlow® Precision and savings! A large commercial North American heat treater expands their capabilities by adding a new ZeroFlow® precision gas nitriding vacuum furnace. 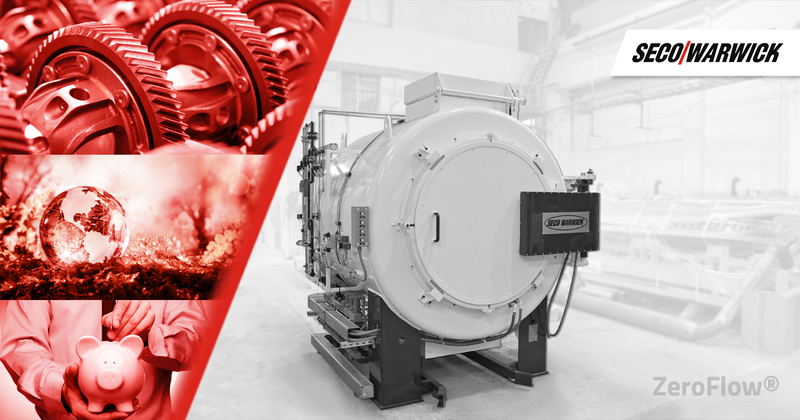 This horizontal, front-loading furnace is designed specifically for precision gas nitriding, ferritic nitrocarburizing, and post oxidation, in a retort-style furnace with vacuum purge. The new furnace complements a prior SECO/WARWICK gas nitriding furnace already in production. It extends the customer’s capabilities by offering greater capacity to its growing nitriding customer base. Among its many benefits, the ZeroFlow® gas nitriding method precisely controls the case depth and nitride layer formation including white layer, achieving high surface hardness, improved wear resistance, and longer fatigue life. SECO/WARWICK offers the proprietary ZeroFlow® control technology. The combination of vacuum purge and only using ammonia as a process gas reduces gas usage and emissions. The gas nitriding furnaces achieve optimum results by using uniform high convection heating and precision nitriding potential control. Along with vacuum purging, the operating cost reductions and repeatable quality are unmatched for nitriding a variety of metals.